Q: There's always candy all over my office, especially with Halloween approaching. What can I do to avoid getting fat from it? Try to keep a full, satisfied tummy throughout the day so you aren't hungry at your desk near the candy--it will be the first thing you reach for. If this doesn't work, get up from your desk and go for a walk around your office every time you experience a craving. Ultimately, the best thing is to avoid having candy at or near your desk, if possible. Or, if you keep some at your desk, keep something that you don't like. But if you do need a candy fix, I'd recommend opting for organic dark chocolate, the only type of chocolate that has any type of benefit that outweighs the calories and sugar. Organic dark chocolate is loaded with antioxidants and is a much better choice than the typical candy bar chocolate. You could keep a bar in the office and nibble on it when you want something sweet. How many pieces of fruit should you eat a day? Are there better-tasting alternatives to Greek yogurt? 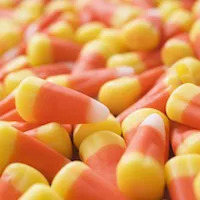 But be very careful about controlling your portions, if you do give in to the candy temptation. Studies show that most people will not stop at one piece of candy once they begin eating it. So I really don't recommend even eating the one piece. If someone believes they have willpower enough to just eat one, that's their personal choice. From experience, this is never the case! Expert answer by: Katie Humphrey, CPT, a certified personal trainer and health and empowerment coach in Ocala, Fla. Read more answers to this question, or ask your own.